The study area encompasses the majority of Canada's largest urbanized market, the Greater Toronto Area (GTA) and includes the City of Toronto and the regional municipalities of Halton, Peel, York, and Durham (Figure 1). 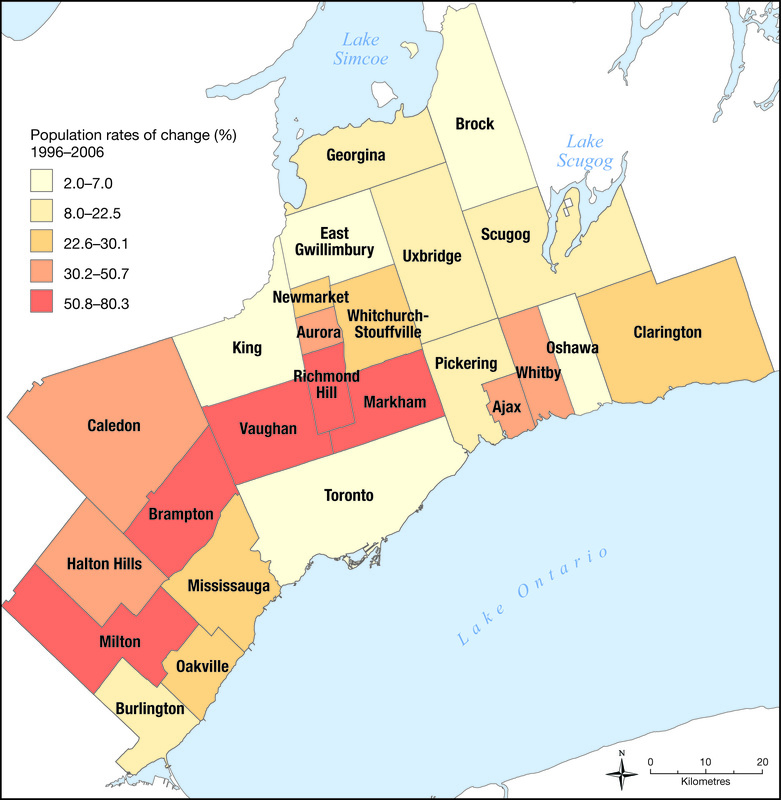 Although the Toronto-centred region is now generally thought of as the much larger area of the Greater Golden Horseshoe, the study uses time-series data that is available only for the GTA. The GTA is home to roughly 5.5 million residents, 2 million households, and an employed labour force of approximately 2.9 million people. It is one of the largest and fastest-growing metropolitan markets in North America and, according to the 2006 Canada Census of Population, home to five cities (Table 1 and Figure 2) within the top 20 urbanized centres in Canada ranked by resident population -- Toronto (1st), Mississauga (6th), Brampton (11th), Markham (16th), and Vaughan (18th). Between 1996 and 2006, population growth was heaviest in the suburban regional municipalities -- York (which grew by 50.7 percent in this period), Peel (36 percent), Durham (22.4 percent), Halton (29.2 percent). During the same period, considerably less growth occurred in the City of Toronto (4.9 percent). We draw a distinction in this study between the central City of Toronto, and the outer suburban jurisdictions of Halton, Peel, York, and Durham. This type of urban/suburban distinction has been used elsewhere for describing regional retail structure (e.g., Simmons et al., 1998; Jones and Doucet, 2000) and is relevant to the mass suburbanization of retailing over the last half century, particularly the growth in large-format retailing ("big-box" stores). During the 1990s, twice as many large-format stores opened in the suburban areas compared with the City of Toronto (Jones and Doucet, 2000). The suburbanization of large-format retail -- sometimes called "retail sprawl" -- in the GTA partly reflects the commercial strategies of the firms involved, which seek to reduce the costs of land and ensure that stores are easily accessible to the driving public. They have implemented these strategies in the absence of a regulatory framework to address the long-term impacts of retail development. The result has largely been the transfer of retail advantage (in the form of convenience and access to low-priced goods) to auto-oriented or auto-dependent suburban households. The widespread, rapid, and large-scale development of clusters of big-box stores into "power centres" (see Table 2 on page 12 for definitions), many of them close to major intersections in the suburbs, is a further development in retailing. This development has accentuated the need for shoppers to rely on the automobile, and thus represents another phase in retail sprawl, following the era of suburban mall development of the 1960s to mid 1980s. In this study, we use the term "power retail" to refer to the retailers and developers involved in post-1990s suburban retail growth. The latest period of retail change appears to be based on the underlying philosophy that "bigger is better" and "if you build it, they will drive to it."